When they hear about search engine optimization (SEO), many website owners get that far-away look in their eyes—many just don’t want to deal with this highly technical subject. SEO is a field that’s constantly evolving, and at larger companies there are people, and even whole teams, whose entire job is SEO. The truth is that you don’t need to get a 4 year degree to understand the basics of SEO and follow them for your website. Just doing these few things will put you ahead of the many websites whose owners have never bothered to learn about SEO (or even worse, are using misguided tactics that could actually hurt their search rankings). Search engines look at the metadata on your site as an easy way to quickly identify what your site is about. That means that URLs, page titles, and meta descriptions are important and should be crafted with care instead of just filled in so you can get to the rest of the page. This tool can give you valuable information on what keywords people are searching for in your industry. Use what you find here to better understand how your customers are thinking about the problems they’re trying to solve, and what topics to focus on in your webpages. When visiting a website, a user typically takes a couple of seconds to get oriented and find what he or she needs, then quickly clicks away if he or she can’t find what she needs. That’s why it’s very important that any key information you want to convey about a page is be displayed “above the fold” — immediately visible without any scrolling. While the fold is an arbitrary term for computers (they don’t have the same limits on vision that we humans do), search engines have embraced the concept because they want to be useful to humans. That means that search engines give preference to websites that state important information above the fold rather than burying it further down the page. Follow this simple rule and you will reap the benefits. There are many good reasons to start a blog, and the SEO benefit is one of them. No matter what industry you’re in, you’ll likely have a variety of keywords you want to feature on your site. If you have a basic website with a few service pages, you’ll find it very hard to include these keywords without sounding like a robot (see #5 below). A blog allows you to generate a large amount of content for your website (including these keywords) that gives search engines a trove of valuable information in terms of accurately categorizing your site. Have you seen one of those web pages that lists every possible product or iteration anyone could search for, including things completely unrelated to the product the page is selling? This technique, known as keyword stuffing, is just one way people have tried to cheat search engines over the years. Thankfully, the practice is now mostly moribund. There are many questionable practices that can supposedly raise your search rank. However, the truth is that search engines are getting smarter and smarter every day, and any tricks you use can end up backfiring and getting you removed from search rankings entirely. There are some great plugins available that can make your life easier when it comes to SEO. The most popular one is Yoast SEO, used by more than 5 million WordPress websites. It really does make it easier to follow some of the other recommendations in this post. It’s important to keep informed on new aspects of SEO, so, if you have the time, consider following some of these SEO blogs. 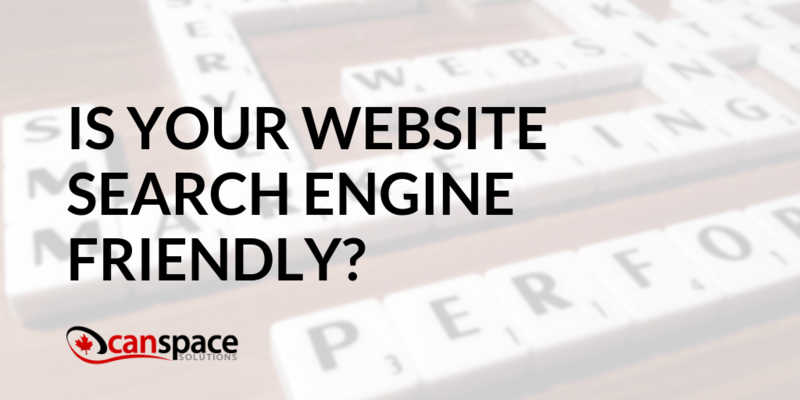 Website performance metrics such as downtime and loading speed are also figured into search engine algorithms because these systems try to identify websites that are maximally useful to their visitors. At CanSpace Solutions, our support team is available 24 hours a day, 7 days a week, to assist with any and all issues you may have. In fact, we strive to answer all support tickets within 10 minutes—even on weekends and holidays—to do our part to help you achieve your search ranking goals. Reach out to us today to discuss your hosting options!